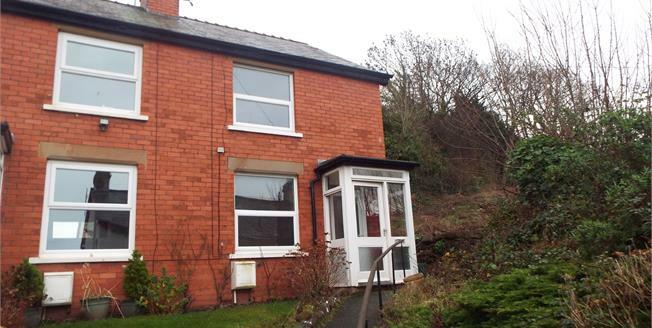 Offering for sale this spacious two bedroom semi detached house located on the outskirts of Old Colwyn enjoying sea and coastal views from the front elevation. In brief the accommodation comprises of; entrance porch, lounge, dining room, kitchen, downstairs bathroom, to the first floor there are two double bedrooms, main with WC. The property also benefits from gas central heating, double glazing, spacious side garden with rear patio area. Viewings are highly recommended to really appreciate what this property has to offer, an ideal investment or first time buyers home, being sold with no ongoing chain. Entrance porch with wooden door and windows to the side aspects, vinyl flooring, wall lights. Double glazed uPVC front door leading into the lounge. Double glazed uPVC window facing the front aspect enjoying distant sea and coastal views. Double radiator, ceiling light. Inner door leading into the inner hallway with stairs leading up to the first floor. Ground floor fitted bathroom comprising of; low level WC, panelled bath with mixer tap, shower over bath, wash hand basin with mixer tap. Double glazed uPVC window with frosted glass. Double radiator, vinyl flooring, part tiled walls, spotlights. WC off the main bedroom. Tiled splash-backs. Low level WC, wash hand basin. Double bedroom. Double glazed uPVC window facing the side aspect overlooking the side garden. Double radiator, ceiling light. Front - There is a shared access from the front leading to the property, pathway and railing leading up to the front porch. Side - There is a generous side garden area with stoned walled boundary. Rear - Small rear patio area with timber built garden shed for storage.